After speaking with his daughters, they all agreed that it would be better for him to stay away from old haunts. So Darinell is planning to make his home here in Little Rock.”I’m waiting on my Social Security benefits since I have arthritis and can’t work anymore. I’ve applied for my HUD-Vash voucher, and I hope I’ll be getting my own apartment soon.” HUD-VASH is a collaborative program between HUD and the VA that combines HUD housing vouchers with VA supportive services to help Veterans who are homeless find and sustain permanent housing. “My advice? Walk away from trouble. I’m just thankful to the VA caseworkers who helped me when I was so down, and to St. Francis House for helping me. 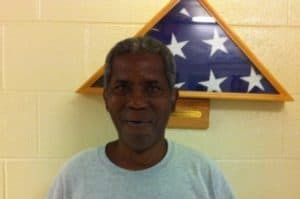 I looked at other places, and I can tell anyone who needs it that St. Francis House is the best place to go.” Thank you for your service Darinell, and God bless you in your life here in Little Rock!